Have u finished this project? I wonder to know, how can you find the correct correspondence between different camera to control the 3D model in 360 degree? (Because Kinect always assume that the user is face forward to the camera, so it only can work in 180 degree!,Left-Right hand problem!). There are still some things to work but I should be able to share a beta version for all existing customers soon. Hi, is there any news about brekel multi sensor skeletal fusion! I wonder if there is any forecast to complete this program, or if there is already a test version compatible with pro body. Hello I am working on the multi Kinectv2 sensors to track the human body. As we have occlusions using single Kinect Camera, we are trying to form one skeleton data by using skeleton data from multiple kinect cameras. I am facing the problem of synchronization of the data frames from the multiple cameras. One more problem is with initialization of the kinect, multiple kinects are initialised at different times (a Kinect starts data collection of the skeleton only when it recognize a human skelton infront of it) so I could not figure out how to make synchronisation between the cameras to fuse the data from multiple cameras. 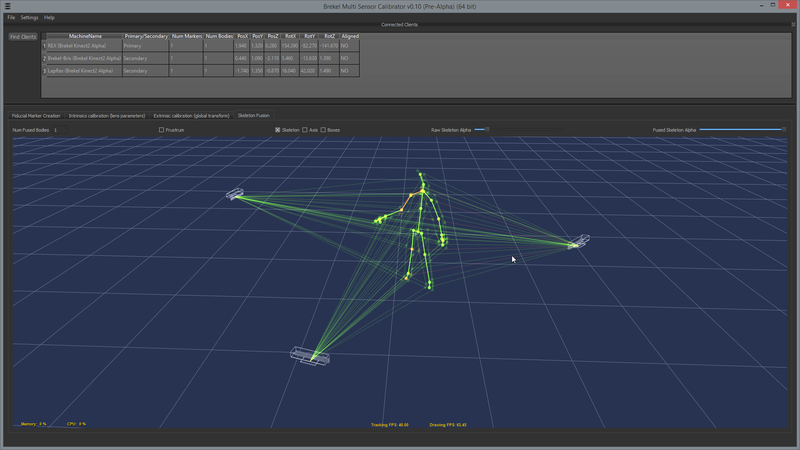 I am also working on the multi Kinect v2 sensors to track the human body. But I face a lot of problem because I am a student and just being to do it.I am wondering if you could gei me your code? Just for study.Thank you! 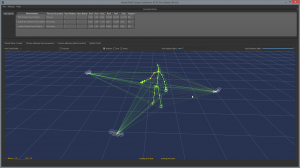 We are using multiple kinect v2 for a surface capture system. We are using checkerboard to calibrate the whole system. However, we notice that the calibration never be perfect. We are considering to use a object(a ball or a Cylinder) to calibrate the system. Could I ask what kind of calibration object you used? Could I have some advice about how to calibrate multiple kinect v2? Thanks very much!! Checkerboards work reasonably well for intrinsics calculation but don’t provide a lot of information for extrinsics calibration. You may want to look into using other patterns, for example ones that also provide info about which way they’re pointing. I’m quite interested in doing mocap with more than 1 kinect sensor (possibly v2) and I’ve been reading about noise due to mutual interference of the sensors. According to it v2 is much more sensitive to reciprocal induced noise than v1 and quoting it from page 30 “The Kinect ToF camera (v2) shows low interference for the majority of the frames (RMSE: < 5mm), but extreme interference errors for some 25% of the frames (RMSE up to 19.3mm) that occur in a sequence which has a nearly constant repetition rate. This behavior is most likely due to the asynchronous operation of the two devices". Did you experience noise due to mutual interference of the sensors? Please describe your experience with noise and the way you coped with it. Thanks very much and keep up with the good job. Yes there certainly can be interference with Kinect v1 and v2, and both are different in nature. With v1 you generally get noise on parts where there is overlap, the noise will be there all the time and can be quite severe to the point where data becomes unusable. This is due to the sensor working by projecting a pattern of dots and analyzing how it distorts in space, multiple devices will confuse each other’s pattern essentially. There was a paper showing how to reduce the noise by adding vibrating motors at different speeds to each sensor but I’ve never been able to get stable results with that myself. The v2 works with about 300 light pulses per second which are also extremely short. There is a small chance that multiple devices will send a pulse at the same time and this will be perceived as an IR image that is too bright, resulting in a shift in Z in the depth signal. In practice this only happens on occasions and phases in and out, I haven’t done measurements but in severe cases the error seems to be in the range of up to 5-10 cm or so. It may be happening less when devices have warmed up but I’m not 100% sure. I’m not at a point yet where I can give a definitive answer on how bad the data is when actually using pointclouds/skeletons but it seems more managble and happening less often than the v1. And there may be some ways (at least theoretically )to compensate. On a side note the v2 sensor’s video and IR streams also allow for easier intrinsic/extrinsic calibration of multiple devices. Thanks for sharing your insights/observations. I read a post where a guy was reporting a reduction of the interference after 20 minutes warming up of the v2 devices. Unfortunately he reported too, in a new post, that after a bit the interference pattern seemed to recur (wonder if the sensor cooled down due to fan operation or interference just due to a random temporal pattern unrelated to sensor temperature). I also read another post where people were speculating about possible randomic change of the 2 modulating frequencies (around 80Mhz) used for phase detection and wavelength period discrimination (such a frequency change being an autonomous sensor attempt to solve potential ambient light and dynamic range issues) and regarding it as a possibile cause of the temporal interference pattern recursion. 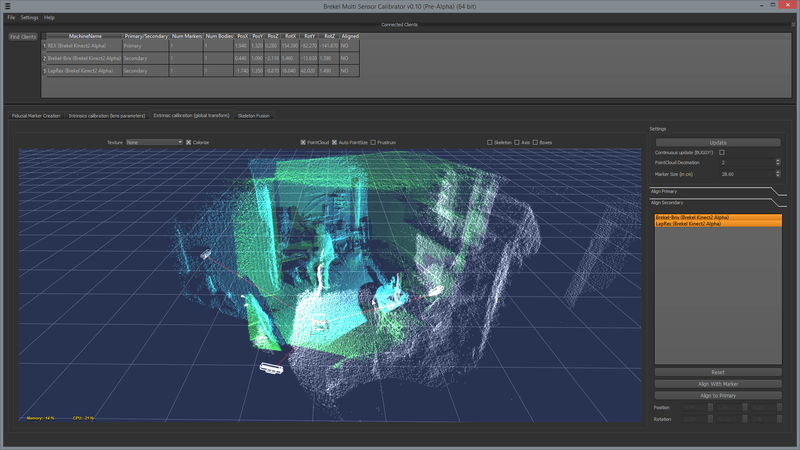 Assuming, as it seems, that there is no external way to synchronize multiple devices and alter the modulating frequencies to avoid mutual interference: perhaps, using the HD RGB camera included, a Visual Hull check and constrain of the point-cloud may be used as compensation for too severe occasional distortions (up to 20 cm in the worst case according to that paper) due to randomic light interferences among sensors, even though such a small number of sensors (2 or 3 in the sensor emitters/receivers overlapping lines of sight) might imply a too coarse visual hull reconstruction rendering it close to useless. I haven’t gone into trying to compensate yet, too much other work to do with calibration and skeleton data fusion first. You may be able to do some detection in the 2D IR image based on intensities and previous frames and compensate the depth values. Any recent updates on the multi-Kinect setup? Hard at work on it…. I am wondering if you will allow for multiple Kinect V1s to be used as well? Since most computers can’t handle multiple Kinect V2s. This would be useful for users that want 360 degree data using one computer. All the groundwork is currently being done with the v2 sensors, haven’t yet tried how well the v1’s can be calibrated with their low quality video but I will investigate that. Also note that most machines can only run up to two v1 sensors unless you add additional hardware. If I’m able to have 2 to 3 Kinect V2s connected to one computer, I’ll be happy… Very happy. So what additional hardware is required to run multiple Kinect V2 sensors from a single laptop (I’m in the process of customizing a laptop purchase)? You cannot run multiple sensor from a single computer (and definitely not from a laptop) due to PCI-Express bandwidth and driver/SDK constraints. I suppose the next gen motherboards with updated PCIe technology and an updated driver/SDK will resolve this issue. Yes, but then it’s still in Microsoft’s hands to support that in their drivers/SDK. I’m surprised that Microsoft would even put any limitations to begin with. The limitation is at a hardware level, software wise multi sensor addressing isn’t implemented since it’s not a possibility on 99.99% of the systems out there. And of course resources of the MS Kinect team are finite. Gotcha. hopefully, the next gen hardware will allow the full use of this amazing product. Thanks for the update. Due to PCI-Express bandwidth limitations you’ll need one machine per sensor. That is referring to the LibFreenect2 drivers, which last time I checked were very slow and needed some good knowledge to get installed and working. I’m using the official Microsoft drivers/SDK which are much more robust and much faster. Note that LibFreenect2 also doesn’t support any (body/face) tracking functionality at all. This multi-Kinect2 fusion is awesome! You are certainly a programming wizard! Do you have any updates on the status of this project… I would definitely purchase 2 more laptops ( 3 total & the Kinects to be a beta tester for you in a 3-Kinect setup ). So you say this has a range of about 4.5m (or 15 feet) so in a 3-Kinect2 setup the largest room “cube” the sensors could capture data for would be 15 feet x 15 feet x 15 feet ??? Just curious. The 3 Kinects would let you turn-around, etc.? I definitely plan to purchase a Kinect and your software for my laptop. The last couple of months life (the not so pleasant aspects) and contract work got in the way of serious dedicated development time. Fortunately I’ve recently started picking things up again and am making progress. It’s still too early to release any more info but I’m definitely looking at opening a beta for existing license owners once the needed features are in a usable state. ik ben van plan Brekel Pro Body te kopen, maar wil 2 kinects (nieuwe versie) gebruiken. Is daar al support voor in Pro Body? Op het moment is deze add-on nog in experimentele pre-alpha fase en nog niet beschikbaar. Je kan wel de software meerdere malen runnen en data van meerdere sensoren tegelijk capturen, maar je zult dit dan zelf moeten combineren in je favouriete 3D pakket. Houd er rekening mee dat je 1 machine per Kinect v2 sensor nodig hebt in alle gevallen vanwege de hoge bandbreedte. Can i link this into unreal 4 engine? Maybe at some point in the future. Any updates about multi-kinect support with Pro body v2? All my time has gone into Pro Face v2 lately, so no new announcement on the multi-sensor stuff just yet. Stay tuned. Yeah i agree ! Multi kinect would be extremely helpfull and i woud use it for sure !! When will it be released ? I have a workstation with 3/multi separate usb3 bus. Will multikinectv2 work with no limitation? There is currently no way to run multiple Kinect v2 sensors on a single machine. The problem is not the USB3 bus but the PCI Express bus it’s connected to. How do I get to be a beta tester. I may have a particular use of this technology. Can I pay for a beta solution, just to support the efforts for development? This is not in beta yet, it’s an internal pre-alpha. What if there’s a PC with multi PCI-E USB 3.0 Controllers? In theory if you have one of those newest types of motherboards and a USB3 chipset connected to those new lanes it could work. But in practice multi device support is not in the drivers/SDK since hardware support is very rare on consumer machines. Which types of motherboards do you mean? The limitation is related to the PCI Express bus speed that the USB3 ports are connected to on the motherboard and the fact that the drivers/SDK therefore don’t support multiple sensors on one machine. OK, but which “newest types of motherboards” do you mean? is this going to be a separate software from pro body2 ?? or just upgrade version. Is there going to be any discount if I have pro body 2?? This is separate software that connects to multiple instances (through a network port) of Pro PointCloud/Body/Face v2. I`ll be very interested to test it as soon as is available. If you are doing a private beta I am a current customer and would like to be considered. At the moment it’s still a highly experimental internal pre-alpha project, once it’s ready for beta testing I’ll announce it on this site and social media streams. dose the multi and probody v2 work with kinect v1 ? The experimental multi-sensor support is also just for the v2. In fact the v1 sensors use a very different way of measuring depth and overlapping multiple sensors generates a lot of noise. The increased resolution of the v2 sensor is also needed for accurately (and quickly) aligning them into one coherent coordinate system. Would your system still be running real-time? How large is the capture volume if you set up multiple kinects? I’ll definitely keep an eye on this! Yes this can still run in realtime on multiple networked machines. Streaming skeleton data is light and so is fusing them. Streaming pointcloud data is too heavy to do at full resolution in 30fps (yes I do compress them) but for visualization purposes they can be downsampled in both space & time. But each machine can receive the calibration data and then record on it’s own at full quality. The size of the capture volume depends entirely on the amount of sensors and their overlap. Given that data becomes too noisy at about 4.5m there are limitations though. impressive setup you got there. I am womdering how you got three kinects connected to a single machine, are they all recording in realtime at once? Microsoft usually states that the data of one Kimect already saturates the USB bus, so I would be very interested to learn how you pulled this off. What are your plans with this software, will this be published and if sp, when and where and at what cost? Do you got some more media than just these three screenshots? 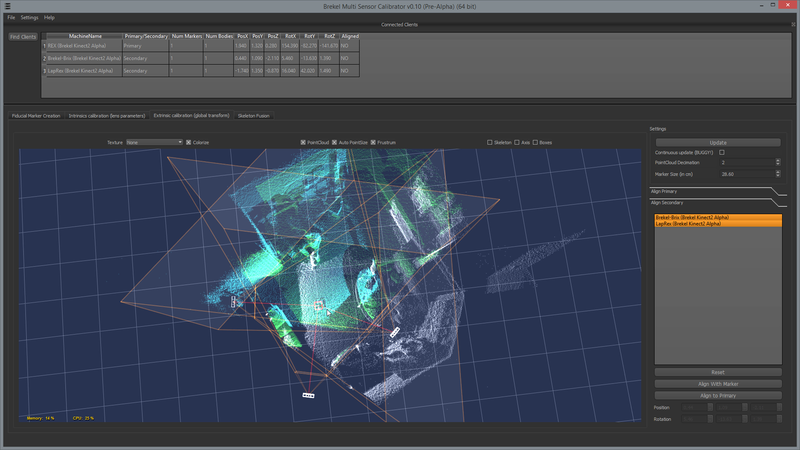 This is running on multiple machines, as MS states one sensor per machine. Since it’s highly experimental internal ore-alpha code it’s too soon too answer questions regarding release, price etc. However I do intend to devote more development time on it once the single-sensor beta apps reach maturity. So keep an eye on this site and social media. Sorry, this will be not be free software. but [Motionbuilder] launch on 1PC. CAN I us build Multi kinect system on Motionbuilder ?